I have a new obsession. Well, not quite new actually, but I seem to go in and out of phases with flavours and ingredients (apart from chocolate, that's a lifelong phase) with some suddenly featuring heavily in my repertoire before being replaced with something else that I will use more than anything else for a while. I've always liked camomile and I've always liked honey. However, lately I have found myself craving camomile tea and its flavour in general. It is smooth and mellow yet earthy, fragrant without being overly flowery, and calming without the sedative powers of lavender. I want to incorporate it in my food in as many ways as possible even if that means messing with classics. Being inventive with classics is one of the things that makes cooking and baking so interesting for me. It's what I've done with the lemon thyme and honey madeleines or my ginger and lime crème brûlée. Whilst I'm fairly certain that I'm in no position to "reinvent the wheel" here, putting my own spin on things is one of the main reasons why I enjoy my "kitchen life" so much. It's fun to experiment and try out new things, and it's immensely satisfying and enjoyable to see the reaction of people when they taste something completely different from what the shape was suggesting. Like in this case. 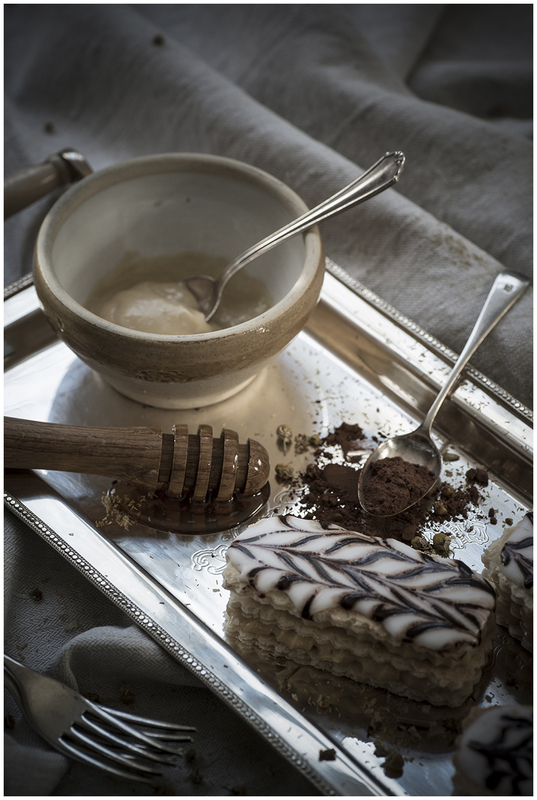 A millefeuille is of course traditionally made with a vanilla crème pâtissière or custard cream, so to suddenly taste the earthiness of camomile with the sweetness of honey is a complete surprise to anybody trying these. Not a bad surprise, I might add. My test people were in fact very happy with the result which is why I decided to share it here. The icing swirls on top do add to the overall flavour with just a hint of dark chocolate which works really well with the camomile and honey. So, without further ramblings from me, here's my recipe for my camomile and honey millefeuille. I hope you'll like them. Make the crème pâtissière first to give it enough time to chill.